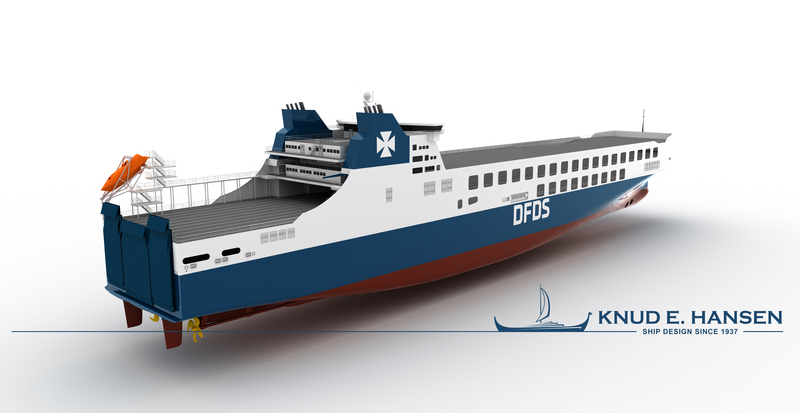 DFDS has today ordered one additional freight ferry (ro-ro) newbuilding for delivery in the first half of 2020 from the Chinese Jinling Shipyard. "This freight newbuilding increases our order book to five large freight ferries, which will increase our efficiency and enable us to accommodate projected growth in our route network in northern Europe and the Mediterranean, support trade and help our customers grow their business,” says Niels Smedegaard, CEO. The newbuilding is similar to the four previously ordered freight ferries and likewise designed to carry 6,700 lane metres of freight equivalent to around 450 trailers. The large capacity decreases unit costs as well as the environmental impact per transported unit. DFDS’ fleet renewal programme also includes two combined freight and passenger ferries (ro-pax) to be delivered in 2021 for deployment in the Baltic route network. In addition, one chartered combined freight and passenger ferry (ro-pax) will be delivered in 2021 for deployment on The English Channel routes. The company Knud E. Hansen doing the design of our Jinling Ro-Ro vessels on behalf of the shipyard has prepared a video showing how the ship will look like in operation. Please enjoy the video here. DFDS’ investment outlook for 2018 is unchanged.